The last time I saw Uatu The Watcher die, it was in a cosmic war between his kin and the Celestials, in Fantastic Four #400. This time around, Marvel is playing things a little closer to earth in the upcoming Original Sin event. Therein, the original and unbeaten Nick Fury assembles a team to find out the 'whodunnit' of Uatu's murder, and to stop all the secrets Uatu has observed - all the secrets you and I have never known - from being made public. Oh yeah, Nick's also got a Steranko-ish flying car that can drive to the moon. While Nick stomps the trail with Iron Man, Thor and his old buddy Captain America, a more 'Marvel Knights' team takes up the same game, featuring The Black Panther, Doctor Strange, Emma Frost, Ant-Man and The Punisher. 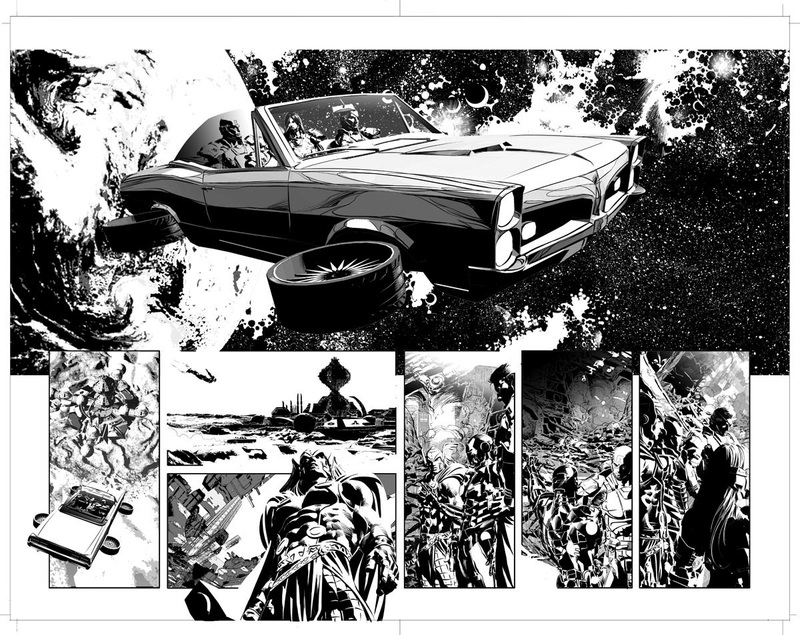 That last group is a perfect fit for event artist Mike Deodato Jr, who will shade the twists of Original Sin with his trademark detail and style. This move is as much of a kick as getting the former S.H.I.E.L.D. head honcho back in the driver's seat. Mike has organically grown his style in front of fans over the years, from Wonder Woman to Elektra to Dark Avengers, and no one is more suited to or earned this 'event' more than he. With a prelude in April, by Mark Waid and Jim Cheung, designed to catch readers up to date, Original Sin will launch this May, written by Jason Aaron, to become eight issues over four months, according to U.S.A Today. Heh--I wonder where those tire turbines are going to find air in space? :) But the artwork looks stunning. I like what Deodato has done with Thor. piff Comicsfan - who needs physics?! :) Maybe it runs on cigar smoke, or is Iron Man armour adaptable? Ohh that's right Marvel characters don't eat or drink any more. Hmm - oh look over there, it's Britney Spears! I will certainly be getting this...Uatu must be the biggest deau ex machine in comics ever but he has his uses. Just a pity this doesn't sound like a FF themed event rather than an Avengers themed event [going by the cast lists], to me the FF would be more worthy in investigating his death as they've had more interaction with him over the years - and this min-series would've served as an ideal vehicle to bring the FF back into the center of the MU. And forgot to add Deodato's art who we discussed a while ago here on this blog, he has a satisfyingly gritty style that will suit this book well. Thanks Karl. If Mike follows this with a Nick Fury book, it'll be top of my pull list in a shot words or no words. As for the FF yiu are right on all of the above. Hopefully the quartets absence is explained in the series, though I wouldn't be surprised if it's not a spin off or tie-in given the relationship. Same with Uatu's former neighbours The Inhumans. A new book, missing from the above, but sure to have a vested interest in the tale all the same. Aaron and Deodato, what better combination could it be? This story does have Reed written all over it but the two teams in place has cool factor at the highest levels. Thanks OA - I'm especially keen to see how Punisher and Black Panther sit at the same table - should be good!